A number of past American Library Association (ALA) presidents have had initiatives related in some way to libraries and community/civic engagement. The 2012 ALA president, Maureen Sullivan, helped to lead a successful Institute of Museum and Library Services (IMLS) grant proposal to work with the Harwood Institute to advance library-led community engagement. I strongly agree the library is an essential community-based resource helping to transform communities, and that this requires more than just service to the community, but engagement with the community. The full ethos of the library should be centered upon engagement, especially focused around its core of information and knowledge power, something that only is developed through transformative action within community. But as I continue to reflect upon the extreme challenges of technology and digital literacy development fostering on social justice within such a profoundly and thoroughly thing- and individual-centered culture, I’m coming to appreciate the considerable danger such a library-focused framing brings. Could it be that within the context of a thing-oriented culture, this statement can be mistaken with the statement made within the Microsoft Empowerment commercial (38 seconds in) “Technology has taken us places we only dream.” — Libraries take us places we only dream. No, no, no! People dream, and people work to achieve those dreams. Along the way they create, re-create, and co-create technologies to use as tools to help people carry out their initiatives. In that vein, the library should be an essential tool, regularly re- and co-created, to help community carry out their initiatives for transformative action and community power through information gathering and knowledge creation. The ALA presidents understand quite well that the library doesn’t magically do this, but that it is the librarians, library staff, friends of the library, the library board, and the broader citizenry that make up the library and see to it that the library-as-people engage so as to transform communities. But in a tech-centric culture, it’s too easy to have the phrase library-led community engagement be mistaken for the need to prioritize the infrastructure and not the people. So I am starting to instead think about librarian engagement leaders. Admittedly, the danger then becomes an individual focus instead of a community focus. So at the outset, let me clarify that while there is real value in having librarians embedded within non-library organizations, I am talking here about librarian engagement leaders working within a library that has an institutional focus of engagement because of the shared value placed upon engagement by the librarians, staff, friends, trustees, and patrons of the library. I appreciate a recent conversation with Kirstin Phelps regarding leader vs. leadership role. Rather than focusing on the “born leader”, we can consider ways in which everyone can and should play a leadership role in building and transforming community to be inclusive, empowering, and just (my understanding of her words). Bringing in work by David Weerts and Lorilee Sandmann (2010) regarding engaged universities and boundary spanning, the engagement leadership role of some librarians will be more community focused, while for others it will be more library focused, some more technical/practical, and some more socio-emotional. 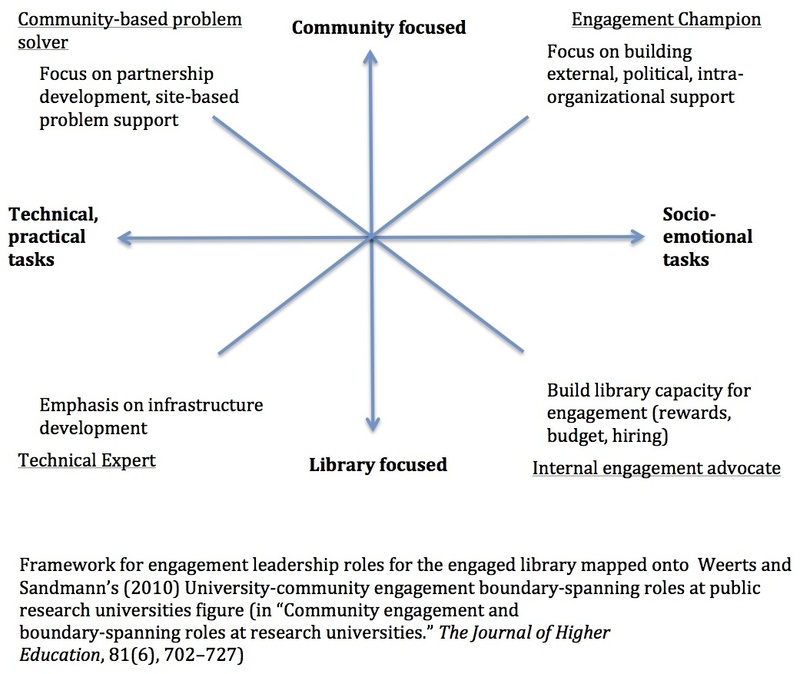 The figure to the right is my mapping of engagement leadership roles for the engaged library onto Weerts and Sandmann’s figure they developed for the engaged university. Often times, and perhaps primarily, the librarian engagement leadership role is to build the leadership roles of others. Librarians, staff, volunteers, board members, friends of the library, and the patrons of the library, together as “the library”, don’t take direct, primary/exclusive responsibility for all aspects of building and transforming community. Rather, the people who function as the library provide critical services to facilitate those who are working in various ways to exercise their leadership roles to build and transform communities. Reflecting on this further, I’m coming to appreciate that even then, these other leadership roles are really just further examples of supporting the leadership roles of still others. For instance, consider a community group who regularly uses the library to organize around a development goal, investigate that goal, and use the resources of the library to implement components of that goal. A librarian may practice their engagement leadership role to support some or all of these different community activities, and in so doing foster the ability for the members of the community group to achieve their leadership roles. But it’s easy to imagine that one common development goal of community groups might be to help support the leadership roles of others in the community, say for instance when teachers, parents, local business owners, and concerned citizens come together to champion new in- and after-school programming to foster student leadership roles. The word community has been misused to the point where it means everything—a workplace can be a community, a city can be a community, an interest group can be a community, even the whole world can be a community. When a word is used to refer to everything, it no longer means anything. Intentionality: Just happening to end up together in a space doesn’t make community. Rather, community comes into being because people continuously work at building it, and only lasts as long as people are willing to continue to invest in it. Mutual interdependence: Reciprocal services, for instance through bartering or exchange of money, doesn’t make community. Rather, members of a community invest in that community because of an awareness that when others benefit, the individual benefits, too. Interconnecting and overlapping roles: Coming together for a single purpose or within a single role is an association. Rather, when we are members of a community we interact with each other while serving in multiple roles, such as workers, students, parents, hobbyists, club members, etc. We get to know each other in a variety of ways and thereby learn about each other’s diverse backgrounds, skills, and interests. Sense of belonging: A statement of belonging to a community is also to define an identity in a deeper sense, along the lines of an amputated hand no longer is part of my body’s community. Within this framing, I take to heart something Randy Stoecker said during his presentation at the 2014 Engagement Scholarship Consortium annual conference. Rather than thinking of community as the starting point of engagement, it is better to see it as the outcome goal. In this way, we begin to consider whether the layout of the space, the types of available services, the choices of particular technologies, and the types of programming within the library are the best possible for helping each of the communities-in-becoming to increase their intentionality, mutual interdependence, interconnectedness, and sense of belonging. The best computers and software, the fastest Internet service, the newest books, the shiniest space, the friendliest library staff will do nothing to build a library organization that instills a culture of community engagement if they are implemented in ways that lead towards individual activities for individual gain. If I reflect honestly and critically on my own community engagement leadership role as a library and information science professional, far too many of my own initiatives have ultimately been less than they could/should because I haven’t yet spent the needed time to problematize the concepts of community and engagement given our dominant culture of individualism. A decade ago Junghyun An helpfully pointed out that my initiatives were less than the could/should because I didn’t aggressively and continuously work to clarify how technocentrism and technological determinism are frameworks intentionally championed to reify systems of privilege within our technical artifacts. A decade later I’m hopeful I have a reasonable handle on this. May my next decade be as fruitful in grappling with community engagement!